Last year, the Federal Reserve raised interest rates four times to keep the economy from overheating and find a stated goal of two percent inflation. Increased interest rates raise the cost of borrowing money between banks and have a ripple effect throughout the rest of the economy. This is one tool the Fed uses to keep inflation in-check. So far, the Fed has signaled that they will hold steady and not hold raise interest rates in 2019, with the possibility of a rate drop increasing as the year goes on. A rate decrease makes it easier to borrow money and encourages investment in an economy showing signs of contracting. In January, the Fed gave their first signal of backing-off tight fiscal policy by not hiking interest rates. 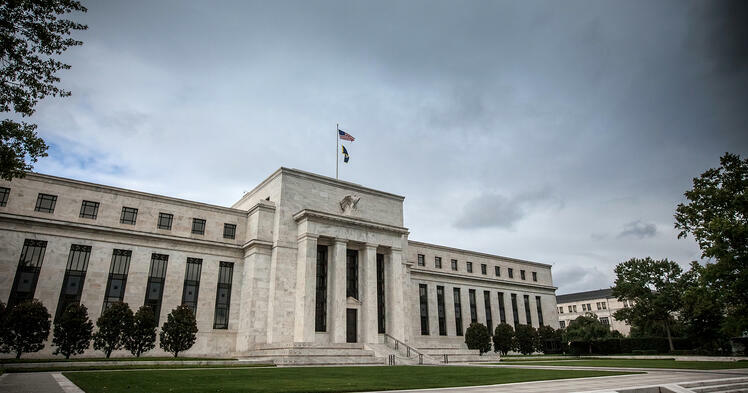 At the March meeting of the Federal Open Market Committee (FOMC), they further solidified that stance with 11 of the 17 members of the FOMC predicting no further rate hikes in 2019. President Donald Trump’s tax cuts and increased federal spending in 2018 created a surge of activity in the economy, but in the face of slowing global growth, the Fed is attempting to continue the waning economic expansion with looser monetary policy. This is all happening against a backdrop of increased worry about the now inverted yield curve and a sharp fall in manufacturing output in the Eurozone, both strong signals of a coming recession. For more commentary on the Fed’s treatment of interest rates, see this piece by MarketWatch and this commentary from Federal Reserve blogger Tim Duy. Reported economic slowdowns in China pose a threat to the health of the global economy. Gross Domestic Product (GDP) growth in China is the slowest it has been in three decades; currently projected to be in the six percent range after decades of greater than eight percent growth. This slowdown is not due entirely to the D.C.-Beijing trade war that has captured the news cycle. Rising wages, a shrinking working-age population, and a tactical shift from an export-based economy to a domestic, service-based economy are all contributors to China’s slowing growth. This does not mean the Chinese economy is on the precipice of crashing global markets. The central government in Beijing is facing decisions about how far to let the type of growth the World has come to expect of China slip and how much should be financed with debt. According to an article published by Foreign Affairs, Chinese households “now owe more money relative to their income than those in many developed countries, including the United States.” Overall, this Chinese slowdown has already hurt the German car industry and Apple also reported slower growth in China this quarter. So where does Orlando fit into all this worry and apprehension about the global economy? Bringing the analysis back down to a regional level, the most recent indicators still show that the Orlando labor market is strong. Released on March 22, preliminary February numbers show the unemployment rate at 3.2 percent, down 0.04 percentage points from January. Year-over-year job growth is 3.9 percent, still the fastest growing job market in the country and 0.8 percentage points higher than the number two, Phoenix. Continuing a trend from 2018, transportation equipment manufacturing is one of the fastest growing industries so far, adding 300 jobs since January and growing 3.7 percent. At the Orange County Regional Economic Summit on March 29, Sean Snaith of the Institute for Economic Competitiveness at the University of Central Florida (UCF) projected continued growth for the Orlando market. 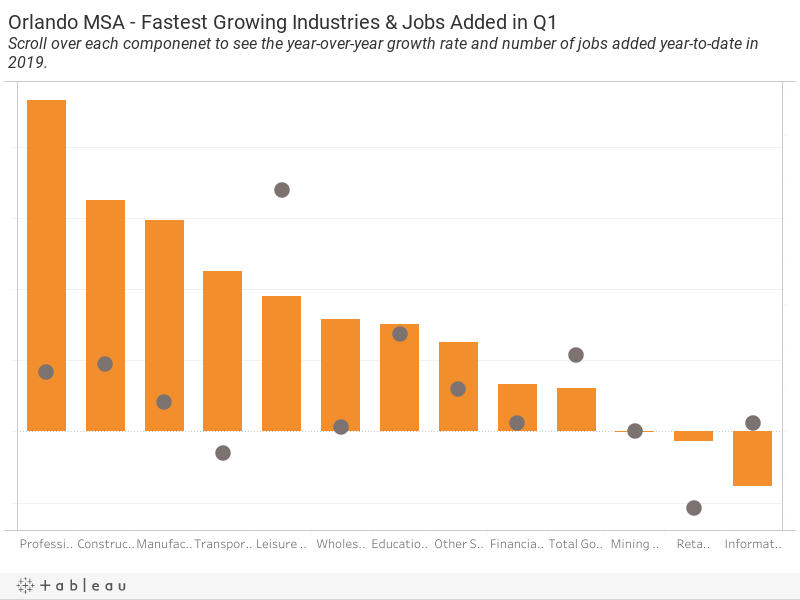 He signaled Q1 numbers for 2019 would have construction and professional and business services continuing as the fastest growing industries in the region. Dr. Snaith also mentioned the Orlando housing market is, “still playing catch-up in terms of building.” Continued low housing inventory is a signal that the hot housing market is not a sign of a housing bubble. Instead the market is trying to keep pace with the region’s job and population growth. Overall, he stated the nation and region appear safe from recession through 2020 “but the recovery is old” and it is only natural for the business cycle to see contraction after years and years of expansion. As 2019 continues, key indicators to watch will be international manufacturing output, consumer confidence and the steps the Fed takes in terms of raising or decreasing the federal funds rate. Orlando is not completely insulated from what happens abroad or nationally; vacation spending is typically the first thing to go when households fall on hard times. However, Orlando’s strong population and infrastructure growth will likely act as an initial shield against a contracting national economy. Orlando ranked the second hottest housing market in the country using Zillow data. Good news for homeowners and national recognition of Orlando as a fast growing, dynamic region; bad news for renters and those struggling with Orlando’s affordable housing issue. Another report highlighted Orlando as facing the most severe shortage of affordable housing for low income renters. Lockheed Martin, one of the region’s top employers, opened a new Research & Development II facility as well as the Cyber Innovation Lab at UCF, continuing their commitment to grow and develop talent in the region. Additionally, TV4 Entertainment, a digital studio and streaming-network operator, announced that it will relocate it’s global headquarters from Los Angeles to the Full Sail University campus as part of a strategic partnership to leverage Full Sail’s production facilities and large talent pool. The United Way released the 2018 ALICE report for Florida. The ALICE report focuses on those households that may be above the federal poverty level but are considered Asset Limited, Income Constrained, Employed. Overall, in the seven-county region of Brevard, Lake, Orange, Osceola, Polk, Seminole and Volusia County, the number of households below the ALICE threshold increased by more than two percent.